“What is man….” (Psalm 8:1-6) Man is triune; a being comprised of spirit, soul, and body. According to science, a human being is simply a physical body made up of flesh, blood, and bones. A temporal biological machine that miraculously evolved from nothing…destined to return to nothing. Of course, this erroneous concept stems from the darkened mind of fallen man…not God. The scriptures portray the Godhead as a Trinity (made up of three): God the Father, God the Son, and God the Holy Spirit, (1 John 5:7). Man, as his triune Creator has a threefold nature, he is a triune being; spirit, soul, and body. All creation bears the design of its Creator. The Atom: the atom consists of three parts, protons, neutrons, and electrons. Matter: Solid, liquid, and gas. Space: Length, width, and depth. Time: Is threefold, past, present, and future. People: All people come from one of three extractions, Mongoloid, Negroid, and Caucasian. The flesh: has three layers of skin; the epidermis, the dermis, and the subcutaneous tissue. Family: The family consists of a man, woman, and children. The sun emits three types of rays alpha, beta, and gamma. These rays are classified as light, heat and actinic rays. The sun emits light rays that can be seen but not felt, heat rays which can be felt yet not seen and actinic rays which can not be seen or felt. The actinic rays (those which can’t be seen or felt) picture God the Father. The light rays which can be seen but not felt picture Jesus Christ the Word of God showing up in human form. The chemical rays that can be felt yet not seen picture God the Holy Spirit. There are three basic elements in the soil which cause plants to grow; nitrogen, phosphorous and potash. Colors: There are three primary color pigments from which all other colors are derived, red, yellow and blue. Blood: solids consist of three main cells, platelets, red cells, and white cells. Human capability is thought, word and deed. Even the most basic forms of life reflect our triune Maker, basic cell structure; true wall, plasma membrane, and nuclear membrane. All are inextricably intertwined and interdependent. The apostle Paul likened the believer to God’s Temple, (1 Cor.3:16 & 6:19) which was divided into three parts; the Holy of Holies, the Holy place, and the outer court, thus once again providing a striking resemblance to man’s spirit, soul, and body. The priority and order are obvious, spirit, soul, and body…not body, soul, and spirit. 1st – The importance of understanding the different attributes and functions of spirit, soul, and body is that it provides the necessary discernment to distinguish between the workings of the “old man” (flesh) and the workings of the “new man” (indwelling Holy Spirit). 2nd – The relationship and interaction between spirit, soul, and body, is the foundational truth necessary to the understanding of numerous other doctrines. The doctrine of the Trinity explained above, is one example. The full effect of Adam’s sin: By examining Adam’s spiritual condition, before and after the fall, through the prism of spirit, soul, and body we gain a deeper understanding of sins affect on his total being. Salvation: The inner transformation, upon salvation, which involves a “spiritual circumcision” (Col.2:11) also involves the believer’s spirit, soul, and body. 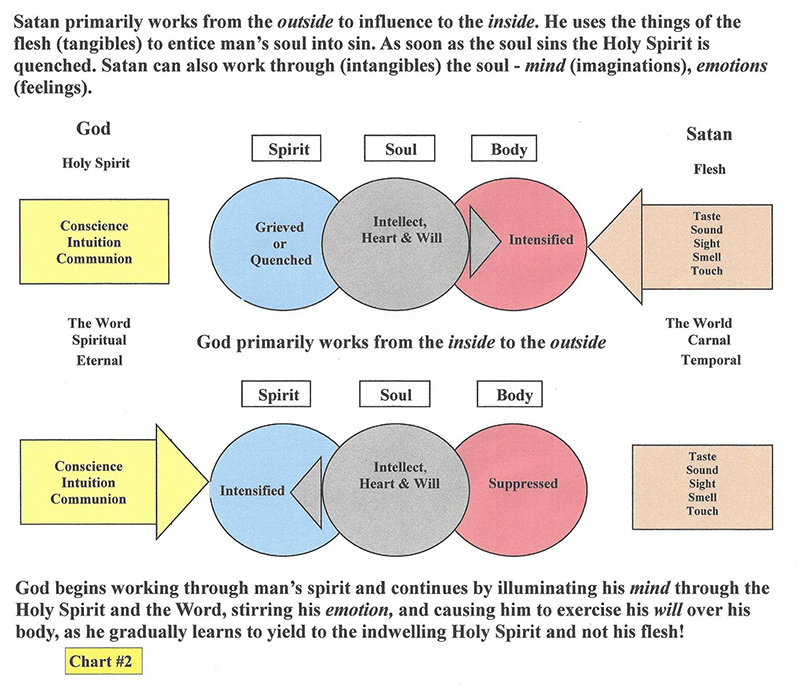 The following explanation of the inner struggle between the believer’s flesh and the Holy Spirit (“old man” verse “new man”) is yet another example of the importance of understanding the correlation and interaction between spirit, soul, and body. Upon salvation, a “new creature” with Christ’s nature is born within (2 Cor. 5:17) yet the old man (Adam’s self-centered nature, the flesh) does not die. Unfortunately, he remains very much alive…his old ways, appetites, habits, and desires still persist; consider, (Gal.5:17-25, Rom.7:17-25, Eph.4:22-24). The flesh manifests its nature through a rebellious self-centered life. What we are dealing with then, is a struggle between an established fleshly nature and an emerging new godly nature. One many years formed and one being formed. In the life of every believer, the mind is the battlefield on which the two diametrically opposed forces contend. The struggle between good and evil involves a battle for control of the mind, heart, and will of mankind. (We will elaborate on this topic later on in the study). Therefore it is crucial to spiritual growth that the believer is able to discern that which stems from the spirit or soul from that which emanates from his flesh. That is, to gain the “spiritual understanding” necessary to comprehend the origin of his thoughts, whether they be spiritual or soulish. If not, he will quite naturally mistake the thoughts or emotions of the soul to be the work of the Spirit. The body is the third and outermost segment of man’s being that which comes in contact with matter. This contact (world-awareness) is made through the five senses of the body, SIGHT, HEARING, TOUCH, SMELL, AND TASTE. It is through these that man is able to experience the physical world, affecting it and being affected by it. The body was formed from the dust of the earth (Gen. 2:7) and shall return to dust (Gen.3:19). The soul is the second segment of man’s threefold being, the medium which stands between, connecting the spirit and body. The soul is that part of man which enables him to be conscious of his existence (self-awareness). The faculties of the soul are INTELLECT (wisdom, knowledge, and understanding), HEART (affections, emotions, and desires), WILL (decision, choice), all of which are responsible for man’s personality. The Intellect of the Soul: Prov.2:10, 19:2, Ps.139:14. Heart: Matt.22:37, Affection, 1 Sam.18:1. Emotion, Matt.26:38, Desire, Ps.42:1.Will, 1 Chron.22:19, Ps.86:4, Ps.77:2, Job 6:7, 7:15, “my soul refused”, “my soul chooseth”, “set your heart and your soul”, “lift up my soul” are all functions of the will which originate in the soul. The soul is eternal and has an invisible bodily form. 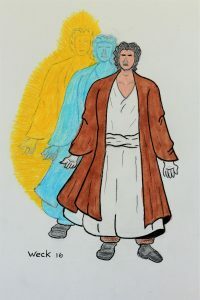 From (Rev.6:9-11) we see that after death the disembodied soul can speak and wear a robe. In (Luke 16:22-24) the rich man’s soul in hell retains his senses; touch, taste, sight, and hearing. The first and innermost segment of man, that which was formed by God: (Gen.2:7), “the breath of life” became man’s spirit, (Job 33:4, Zech. 12:1, Eccl. 12:7 and Isa.42:5). The spirit is the preeminent part of man, that which joins him to God. The three main elements of man’s spirit are CONSCIENCE, INTUITION, and COMMUNION. These operate independently of the soul and body, enabling man to have fellowship with his Creator, (God-awareness). The Conscience convicts of sin, reveals guilt, “reproves” (John 16:8). “This is not accomplished by the influence of the soul or through information stored in the mind but rather by spontaneous direct judgment. The conviction experienced via the conscience is independent and direct. If a man should do wrong it will immediately raise its voice of accusation.” Watchman Nee (The Spiritual Man). Consider, (John 8:9). That the conscience always convicts of sin and promotes righteousness proves that it cannot be of our own hearts (soul) for “The heart is deceitful above all things, and desperately wicked…” (Jer. 17:9). Mind and conscience are not the same; consider Titus1:15. In my understanding, conscience is that inborn, universal standard (comprehension ) of right and wrong that God has built into humanity (John 1:9). Light and conscience are inseparable; they operate in conjunction. Both reveal and convict; rendering every man accountable. Intuition is the antenna of the human spirit, the means of spiritual reception. It is the opposite of the physical senses of the body and intellectual understanding of the soul. “Intuition involves supernatural sensing without conscious reasoning; knowledge which comes to us instantaneously (from outside in) without any help from the mind, emotion or will. In reality, we really “know” through our intuition; our mind merely helps us to understand. The revelations of God and all the movements of the Holy Spirit are known to the believer through his intuition” Watchman Nee Consider (1 Cor. 2:10-11, Prov.20:27, Matt. 16:16-17, contrast, Ezek.13:3). The restoration of a personal relationship between God and man is at the heart of salvation. Through the “blood of Christ”, peace and fellowship with God have been restored. The spiritual union between God and man; that vital life relationship has been renewed. Having been “born of the Spirit” the “new creature” has the opportunity, “through the Spirit” to enjoy intimate COMMUNION with his Creator, “That I may know him…” (Phil.3:10). God is not apprehended by man’s thoughts or efforts; man perceives God intuitively. Likewise, God communicates His will to man intuitively, through man’s spirit, (1 Cor.2:11, Prov.20:27, Ezek.13:3, Matt. 16:16-17). Consider the apostle Paul’s prayer for the Colossians, (Col. 1:9) notice, “spiritual understanding.” God desires to renew our minds via His Spirit working through our spirit. At the same time, Satan is attempting to further poison our minds through the five senses. Examine the chart below illustrating the inner struggle. As we have learned, man is connected to the physical world through his five senses and to the spiritual world through the faculties of his spirit. 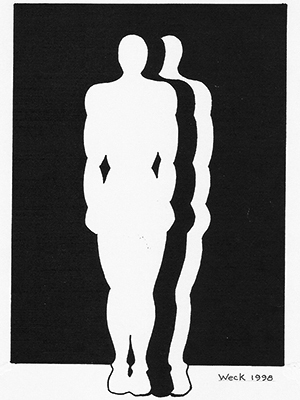 As illustrated in the above drawing the spirit and the body merge in the soul, thereby joining them together. The spirit cannot influence the body on its own, nor can the body affect the spirit by itself, they need a go-between, the soul is that medium. The soul, like a steel ball suspended between two magnets, simultaneously influenced by both, plays the part of a rope in a spiritual tug of war. While the analogy of the steel ball placed between two magnets will suffice to illustrate the opposing forces exerted upon the soul by the spirit and body, it is incomplete because of the soul, unlike the steel ball, possesses the power of choice. The soul, due to the fact that it is the seat of free will has the power to choose between these two contrary forces. Fellowship with the Lord intensifies the magnetic pull of the spirit and stifles the influence of the body. Conversely, fellowship with the world coupled with neglect of God and His word strengthens the flesh, grieving and quenching the indwelling Holy Spirit. When the soul is yielded to the Lord’s influence (the Holy Spirit) working through the believer’s spirit, he is said to be “walking in the Spirit”. On the other hand, when the soul is yielded to the body of flesh the believer is then walking in the flesh. It all comes down to choice and priorities. “Know ye not, that to whom ye yield yourselves servants to obey, his servants ye are to whom ye obey…” (Rom.6:16). The soul itself is not neutral and can also play a big part in hindering the Holy Spirit’s control. This is especially true in the case of a person who has spent many years unsaved. In such a situation the soul may well have been exposed to a tremendous amount of ungodly thoughts and activities while in darkness, (Eph. 2:2-3, Titus 3:3). Even though a person is forgiven these upon salvation, godless thoughts, images, and sinful habits remain ingrained in his mind (soul). The eye-gate is the primary entrance to the soul. To illustrate: Eyes the projector, heart the screen and mind the computer (memory). The eyes project indelible images upon the heart, which are then stored in the mind. Whether prior to, or after salvation, all evil which has entered through the unguarded eye-gate is permanently stored in the mind. Thus providing the enemy internal poison with which to hinder the Holy Spirit. The effect can be profound and lasting, adding much resistance and frustration to the battle for God’s control of the total being. Henceforth the apostle Paul’s exhortations in, (2 Cor.10:3-5, Rom.12:2). The soul can also obstruct progress by taking control of man through his intellect. When the intellect is increased through knowledge, pride is stimulated, “Knowledge puffeth up…” (1 Cor.8:1). As a result, man’s self (soul life) will be intensified, which will, in turn, grieve and quench the indwelling Holy Spirit. “…God resisteth the proud, and giveth grace to the humble.” (1 Peter 5:5b). Human knowledge competes with God’s knowledge.” For whosoever exalteth himself shall be abased; and he that humbleth himself shall be exalted.” (Luke 14:11). All quotations (other than scripture) are information from “The Spiritual Man” by Watchman Nee who the Lord graciously used to shed much light on my understanding of this crucial subject.